Two years into the market share war, Saudi Arabia increased its market share by one point. Was it worth it? Two years ago, a barrel of oil sold for $82.04 US, and Saudi Arabia was producing somewhere around 9.75 million barrels a day, a potential $800 million a day in revenue. Last month, Saudi produced 10.5 million barrels a day and sold that oil for less than $50 US a barrel, a potential $525 million in revenue per day. No matter how you do the math, that's a chunk of foregone revenue over the past two years of pain. The world's largest oil producer increased its market share by one percentage point to around 13 per cent of the global market, but lost market share in some parts of the world, like China. That came at a huge cost to its government coffers, to other OPEC members, to Canada, to the U.S., to tens of thousands of people who have lost their jobs. That depends on the exact goals of Saudi Arabia. Obviously, increasing market share in a highly competitive market is not nothing. But according to Jackie Forrest, vice president of energy research at ARC Financial, that wasn't the only accomplishment. Saudi increased its production and forced others to slow down. "This year alone, from the beginning of the year to now, non-OPEC producing countries like the United States, Canada, Russia, in aggregate, are down about 1.2 million barrels a day," said Forrest. "Half of that is coming from the U.S., that tight oil production, which was really the antagonist that started this price war." Saudi had little choice but to turn on the taps, according to Jim Burkhart, chief energy researcher with IHS Markit. The other option was to cut its production to support the price and see the U.S. continue to grow. Historically that hasn't worked out for the nation. "In 1980, Saudi produced 10 million barrels a day and they started to cut, cut, cut to support prices," said Burkhart. "And eventually they found themselves producing three million barrels a day and prices were lower. Their actions meant that a lot of other people made money and they lost money." Over a two-year period, Canada also increased its market share, fractionally. According to data from the U.S. Energy Information Administration, it increased production by 60,000 barrels a day in 2015 and was on track to continue that trend before the Fort McMurray fires that took production off-line last May. That increase has come from the oilsands, while conventional production has shrunk. But Saudi Arabia was effective in slowing the growth curve of Canada's production. After 2020, it`s not clear where production growth will come from because of the cancellation or postponement of oilsands projects. "The fruits of that won't be seen for a while because we're still building and completing those projects that were sanctioned back when we had $100 oil," said Forrest. "But I think over the course of the next few years, in 2018, 2019, the real implications of this period of very low capital spending are really going to show up because we are not going to have some of those big projects come on that are needed to offset declines in other places." The United States has taken the biggest hit to production in the past year or so. From its peak in July of 2015, U.S. oil production has dropped by 1.2 million barrels per day. At the same time, U.S. producers have been forced to become more efficient. 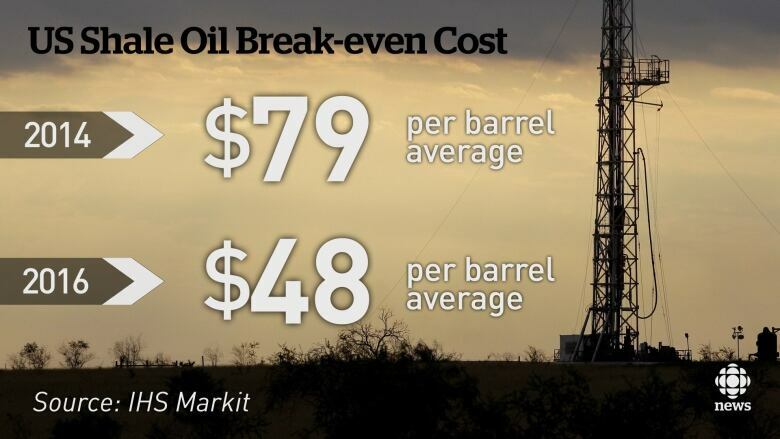 The break-even price to produce a barrel of shale, or tight oil, has dropped drastically in the U.S. In 2014, that break-even price was close to $80 US a barrel, Burkhart said, including variable costs, fixed costs and a 10 per cent cost of capital. Last week, it was under $50, on average, as service costs go down and wells become more productive. That means that oil does not have to move much higher before U.S. producers get busy. So the Saudis will continue to look over their shoulder. "In some respects, it's made their competition even more powerful than it was before this downturn," said Forrest, who also pointed out that Saudi Arabia was not expecting other OPEC nations to increase their production as sharply as they have. 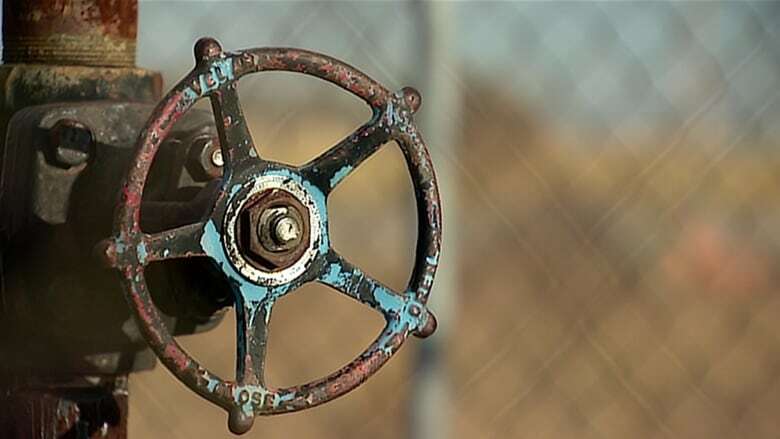 The so-called Gulf 5 — Saudi Arabia, Iran, Iraq, Kuwait and United Arab Emirates — have increased their production by nearly three million barrels a day in the past two years as they pump more to pay the bills. Oil prices recovered to above $50 US a barrel last week on hopes that OPEC members will formalize a cut to production when they meet in Vienna next month. That will mark exactly two years since the meeting in November of 2014 that pulled the rug out from under the oil market. Skepticism about whether OPEC members can agree who will cut how much and whether non-OPEC producers, including Russia, will respond with a freeze has reigned since that cut announcement in September. But it's no great leap for OPEC to cut production to 33 million barrels per day. 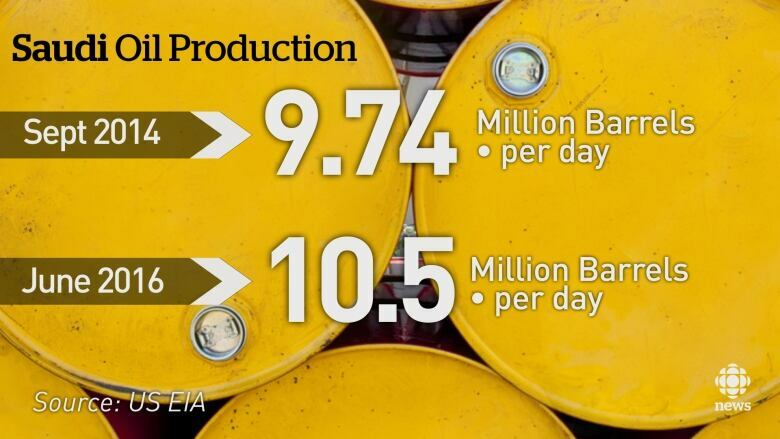 It produced 33.6 million barrels per day in September. "This discussion reflects trends that are already in place without an agreement," said Burkhart, pointing out that most Gulf nations are pumping close to their capacity and that the Saudis produce less oil in the fall because they no longer need to burn oil to generate electricity to power air-conditioning. So seasonally, this is a time when Saudi production gets lower anyway, he said. "You could call that a cut, but is there less oil for export markets? No." It's tempting to describe that as Saudi Arabia getting what it wants, a price increase, while maintaining its extra market share, at least for the time being. "It's been a difficult two years for all producers," said Burkhart. "But should they have pursued a different path —probably not."